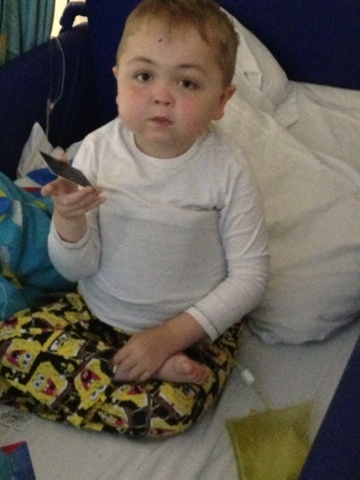 Harvey's Journey : My Last Day On M3 . .
For the past week I have been on Ward M3 and I've really enjoyed it. The staff have been great, even the ones who haven't looked after me have been coming over to see me and play with either my Lego or Duplo with me. The nurse I have had the most is Maxine and I really like. Yesterday, mummy was showing her pictures of me doing different things (on the beach, dodgems, at TGI's) she liked looking at them. Mummy also showed her a picture and video of before this pain started, how happy and smily I was. Maxine started to get a bit teary, she said she's going to miss me and I'll miss them all on M3 too. I'm going to make sure mummy brings me down to see them again. Whilst I've been on here I've been in the bay because all the patients are neutropenic anyway so it is safe for me, it's been nice. I've had people around me, pick pocketed patients parents, had people come play with me and I also was able to meet Sam (he's from M2 too but hadn't met him until now because I was in my room). Sam's nan has been playing with me all week, she was giving me cards and her comb to play with. All favourite things of mine. I also met his grandad yesterday, his pockets were empty!! Been using a heat pad to see if it helps with the pain I get, mummy thinks it might be but still trialling it to see. Yesterday I slept majority of the afternoon which worried mummy but she said she's hoping its just me catching up on sleep and not the usual thing it's means, I'm brewing something!! Mummy's not been taking photos recently because I've not been myself and doesn't want photos if me in pain but she did manage this one. I am wearing the heat pad in here which is why my belly looks square and it comes up to my arm pits! !